The Unilever Precinct (also sometimes called “East Harbour”) is a large district of Toronto ready for development east of downtown, across the Don River. The area, once a soap factory, is zoned strictly for employment and is being planned as a dense office district with 50,000 jobs, but there has been a debate over whether it should instead be a mixed-use area (PDF) that includes residential buildings. Residential makes more money for developers, so if you allow some residential in an area, it will outbid any other uses and dominate the development. The Unilever lands are the largest piece of undeveloped employment lands south of the 401. Because residential development is more valuable, Toronto will not get any new employment areas, and needs to preserve the finite amount of employment space that it has. The City makes money on commercial properties (receives more in property taxes than it spends on services), but loses money on residential (it costs more to service than it raises in taxes). Because residential uses are more valuable, when property taxes are assessed on a property that could be either residential or commercial, the taxes will be assessed by MPAC based on the potential residential value, meaning that property taxes will be higher than for purely commercial areas. As a result, commercial uses in such mixed-use locations are at a disadvantage compared to strictly commercial areas. Employment areas thrive on clustering – companies want their offices near the offices of other companies and commercial services, and people like to work where other people work. The more clustering, the healthier the employment district. Office space generates the highest transit ridership – two times as much as an equivalent amount of residential space. And the Unilever lands will be a transit hub (eventually, in theory), with a GO/”SmartTrack” station, a Relief Line station close by, and a streetcar down an extended Broadview Avenue. Whether one is convinced by these arguments or not, it is clear that the City is determined to keep the area strictly zoned for employment. Which raises two questions. The first, which the City does not seem to have addressed much so far, is about nearby housing. Transit is important, but increasing numbers of people prefer to walk or cycle to work – a more comfortable and reliable commute, with added health benefits. What’s more, such “active transportation” commuting is good for the city, because it reduces the need for expensive motor vehicle and transit infrastructure. The amount of employment expected in the Unilever lands will inevitably create enormous demand for housing within walking and cycling distance around the area, driving up prices and creating significant development pressure. So, what are the City’s plans for managing that pressure? And will the City be able to ensure some of the housing in the area is affordable? At the meeting, the City said there were 55,000 people living nearby currently. But of course those people already work somewhere else. It’s safe to say that, of the 50,000 new employees in the area, some will want to live nearby. It’s also important to remember that not all of those jobs will be high-paid – there will be assistants, maintenance staff, retail clerks, people in entry-level jobs and many others who cannot afford the high prices of new market-priced developments. Some new housing has already been built nearby on the west side of the river, in the West Donlands. It does include some affordable housing, and there is still more development to come in that area. 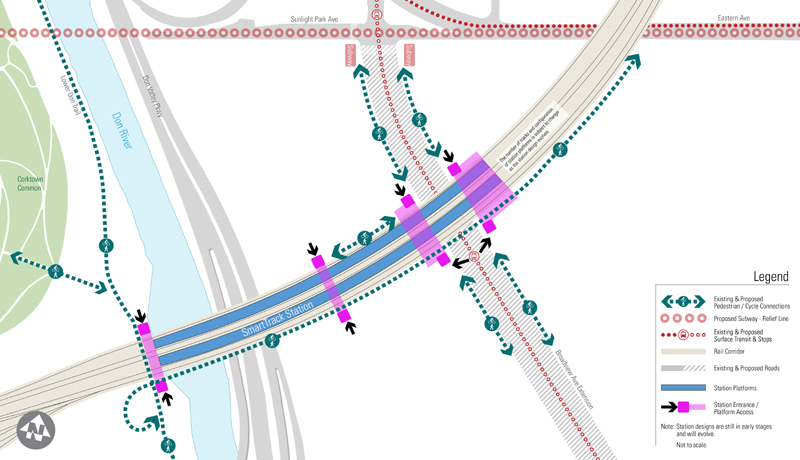 One of the most innovative aspects of the Unilever plans is for the SmartTrack station to lie across the Don River, which enables it to also provide a walking and cycling bridge from the west to the east side of the Don. It means that the West Donlands will be in comfortable walking distance to the new offices. South of the Unilever district, in the Port Lands, there is enormous potential for new housing, and since the development is under the control of Waterfront Toronto, a reasonable percentage of that should be affordable. 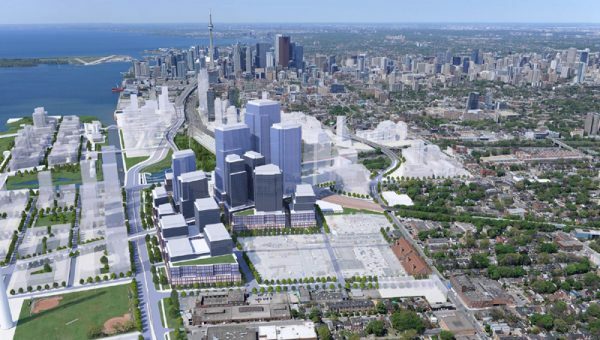 But that development is quite far in the future – it won’t happen until the massive plan to create a new mouth of the Don River is completed, and other phases of the Port Lands have been developed, by which time the Unilever development is intended to be well underway. It would be helpful for the City to show how the Unilever plans will work with the Port Lands plans. Perhaps the areas directly south of the Unilever lands could be moved up the priority list so that they are developed in closer tandem with the new employment area to their north. The final area that the City needs to think about is an already-established one, the Riverside district along Queen Street East and especially the southern part between Queen and Eastern. Some new mid-rise condo buildings have already been built in the area south of Queen and west of Broadview, with more to come. Queen Street in Riverside will be undergoing a Heritage Conservation District study, which will help define development on the street itself. But there will certainly be a drive to redevelop any non-heritage buildings into midrise condos. And what about the residential streets between Queen and Eastern? Given what will undoubtedly be the demand, should the City consider re-zoning them for greater density? The Unilever plan is oriented towards dropping in height as it gets closer to these residential areas. But even at a normal house height, the City could allow houses — or at least, some of them — to be replaced with three-story walkup-style or triplex apartments or condos in these areas, enabling them to house a lot more people. But of course that kind of construction impacts existing residents – even if their property value goes up, that is not much help if they don’t particularly want to move. And some of these houses could have heritage value worth preserving. Yet the alternative is expensive and exclusive single-family homes for a small number of people in what will become a very desirable location. Whatever the choice, it’s a question the City needs to face up to before the project gets underway. And what about affordable housing? Could the City be buying land in Riverside now, to set aside at least some more space for developing affordable housing? Land there is already expensive, but it will only become more so, and the City could possibly use money generated from selling surplus land elsewhere to buy some new land to set aside for building additional affordable housing that would be available for people working in the new office district. A joker in the pack is the bit of land across the tracks just north of the Unilever lands, where the BMW dealership is now. Will the City likewise insist that this area remain employment lands (PDF)? Or might the city relent and allow that area to be mixed-use and include housing for the many new employees south of the tracks? The second question with an all-employment zone is the danger of it being dead after working hours and on weekends. An argument for mixed-use areas is that they will stay lively – and support local businesses – even after office workers have gone home. The City has tried to address this question by expanding the definition of employment lands (PDF) so that the area can include destinations such a entertainment, museums and community centres that would draw people to the area after hours. And it does allow hotels, which would mean some people are in the precinct off-hours. But will these be enough to give life to such a large area, especially one somewhat cut off from its surroundings by the railway tracks and the river? Here’s an idea that could address two City dilemmas at once. The City has been fighting the tendency of apartment and condo owners to rent out entire units for short periods using AirBnB and similar services. Such rentals are essentially commercial, but being done in residential areas, which has caused disruption. Why not designate one or two buildings in this purely commercial area as short-stay (28 days maximum) apartment rentals where investors could buy individual units for the purposes of renting them out via AirBnB and such? It could fill a gap between short-term hotel service and long-term residential rentals for which there is clearly already a demand in Toronto, and it would certainly be a useful service in a area likely to see many people needing to stay for a week or two on business. Plus it would bring additional population to the area to give it some local life after business hours, and help support restaurants, stores and entertainment. Regulations would need to be worked out, but when it comes to AirBnB there’s already been a need for regulations in any case. Even if the Unilever Precinct is not mixed-use and doesn’t include residential within its boundaries, housing will be a key issue for this development, for which the City will need to plan carefully. The fact that residential development is a financial detriment to the city, combined with the coming drop in LTT revenue, the city needs to stick to it’s position. Oh look, Toronto is going to make the same mistake they made in the early to late 80’s. Mixed-use seems to have become a mantra. But employment lands are great places for the incubation of new business. The buildings can be a bit decrepit, and industrial/commercial don’t mind as the rents are lower but housing in old warehouses seems to become fancy lofts. Not that that applies here, but that’s basically my concern about mixed-use. We need some spaces to provide for some business uses, like the bus parking lots for greyhound, or the package sorting buildings for canada post, or the movie studio lands. As for this site, this employment space will become a good core for the surrounding residential areas and a good site for head offices and services that need to be near the central core. It will facilitate a massive transit upgrade. It will hold commercial space that would otherwise likely be built at the expense of the low-rise area east of downtown. There is so much positive in this concept for the site, that I don’t think we should concerned about its overly commercial nature. There will likely be plenty of use at all hours. I am concerned about the areas to the south and the industrial uses that are likely to disappear, like boat repairs and services, the movie studios, the industrial buildings that house things like habitat for humanity. Cement delivery by boat remains a viable industry. We should not overly gentrify the area. Interesting thoughts on designated AirBNB-type buildings. I’ve never heard anyone think of this before. I’m not saying it is a good or bad idea, but an interesting one that should be at least considered.